The Museum has a space in the Santa Maria Town Center Mall, located on the southeast corner of Main and Broadway in the center of Santa Maria [Yahoo Map.]. The Museum is located on the second floor, three doors north from the main escalators as you head toward Sears. A docent is available for information as you enjoy the various displays. 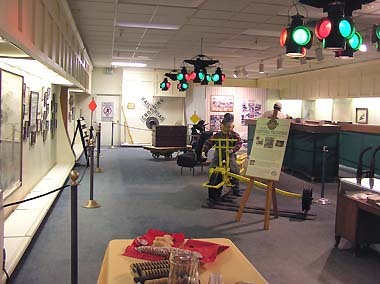 There is a small gift shop in the Museum (Madson's book, Railroads of the Santa Maria Valley is available), as well as some model railroads to see. Often, modelers are present working on the HO layout of the Santa Maria Valley Railroad. Holiday Lionel Open House, 12/11/04. SMVRR No. 10 Hood Arrives at the Museum, 8/2/03. Museum display cases and photos. HO layout of the Santa Maria Valley Railroad. HO layout of the Sedona, Arizona area by Skip Purper. 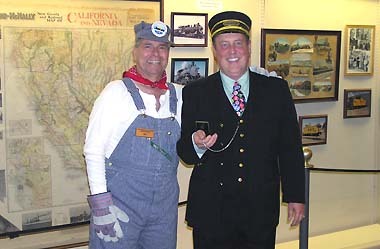 A book signing event at the Museum (September, 2001), including more pictures of the interior areas. Layout in the Museum window. We acquire a 4-wheel standard gauge cart. SMVRHM Volunteer Hours Spreadsheet [Excel, 16kb].